Digital conferencing for your small business can be a combination of a number of different conference solutions including web conferencing using audio, video and teleconferencing. Business budgets may prohibit some of the more expensive solutions but web conferencing should already be included in your computer package. Digital conferencing is the use of Internet and telephone systems to hold virtual meetings. Instead of actually attending a meeting, presentation or conference, workers will simply log onto their computer and attend the meeting. Whether you can simply join the meeting by text, audio, or visual means will depend on the technology your business has implemented. Web conferencing is no longer a thing of the future; many businesses have had this technology within their business for a few years. Basically all workers that attend a web conferencing meeting will go to one web page where the meeting is being held. An administrator will usually have set up the conference and notified staff when the meeting is being held and how to access it. Participants can take part just as they would a normal meeting, although the amount of interaction will depend on the type of conferencing technology that is used. The most basic form of web conferencing using text to communicate is now seen as old fashioned. 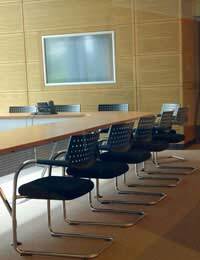 Most businesses will at least have audio digital conferencing facilities. The use of cameras and microphones ups the stakes even further, and a video conferencing system will usually be about the most sophisticated web conferencing facility available. Video conferencing does not usually have any times delays and allows smooth interaction between attendees. Teleconferencing using microphones and webcams does allow the same sort of participation as video conferencing but the visual quality will not be as good. Audio quality should be fine but there may be a short delay in the visual quality. Video conferencing systems will cost more, but there are usually good deals to be had by leasing this equipment. Leasing will also allow upgrading of the technology as and when needed. It does not take long for web conferencing technology to pay for itself. Look at the price of having multiple workers attend meetings outside of the office environment and the cost effectiveness will soon become apparent. Web conferencing is also useful for home workers and outsourced employees that cannot attend meetings. They can simply log on and participate in real time without the need for travel and hotel expenses. Web conferencing is very cheap when compared to making international calls. The most basic web conferencing technology should already be available within your own computer systems. There are web conferencing providers that will be able to supply the more sophisticated conferencing technology, but if you have IT staff they should be able to easily implement the basics. Audio conferencing should not be beyond the capabilities of even the least technically minded person. Internet help and advice on web conferencing is widely available and free to use. Digital conferencing is still a relatively new technology but developments are happening rapidly. Present technology prices fall dramatically with every new development and web conferencing for mobile phones including video conferencing is starting to become more popular. Online communities look set to grow even larger and this is a huge customer base that businesses cannot afford to take for granted. Digital conferencing between customers and businesses is a logical conclusion and will open up markets on a global scale. Digital conferencing using web based technology is must if businesses want a keep up to date. Employees have come to expect this sort of technology in the workplace as a way to conduct business. With the rise in outsourcing and home workers businesses cannot afford to use outdated technology to keep in touch with their staff, or their customers. Great article. Digital conferencing technologies such as web conferencing, video conferencing etc. helps businesses reduce travel costs, better client interaction, better team collaboration etc. RHUB web conferencing appliances provides all in one solution wherein, one can conduct web conferences, video conferencing, free audio conferencing, webinars, remote support and remote access. It is very easy to use and is only one time cost as compared to hosted services.